Karen Felter (University of Muenster), “’The Middle Way of Truth’: The Role of Christ in Anne Conway’s Trinitarianism,” presented to the “Origen and the Roots of ‘Human Freedom’ and ‘Human Dignity’ in the West Seminar,” 20 November 2017. The group of seventeenth century thinkers, known as the Cambridge Platonists, is theologically renowned for its ties to Origen. However, a comprehensive study of Anne Conway’s theology has never been conducted. This paper contributes to rectifying this by examining Conway’s conception of the Trinity. While Conway deploys the doctrine of the Trinity in the context of neo-platonic systematics, two basic features of her teachings are distinctly Origenian: Firstly, Conway’s process soteriology is based on Origen’s idea of apokatastasis. Conway views Christ as the necessary mediator between God and creation as every being works towards restoration. Christ participates in every being separately in what Conway refers to as “intimate presence”. The idea that Christ accommodates individually in the salvific process is distinctly Origenian. Secondly, Conway’s Trinity is characterized by the polarity of “motion” and “rest”, as is Origen’s. I argue that this is foundational for her critique of Cartesian Dualism. Derek Michaud (University of Maine), “Reimagining Revelation, Tradition, and the Development of Doctrine,” presented to “Traditions of Interpretation” session, Christian Systematic Theology Unit, 19 November 2017. This paper argues that rather than more or less distinct loci in systematic Christian theology, revelation and tradition should be conceived of as aspects of a single communicative act initiated by God and received by humanity and played out through time. 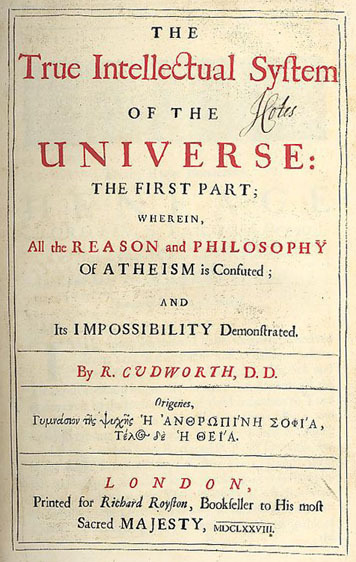 Borrowing an image from the forward pass in American Football, and building on the arguments of the Cambridge Platonist John Smith (1618-1652), I argue for and understanding of tradition (etymology notwithstanding) not as something to “hand on” but as the history of the reception of God’s self-disclosure. The “development of doctrine” therefore is the process of receiving what God is (and has always been) sending us in a changing world. Tradition is reimagined as a source of doctrinal authority but not as a collection of content so much as a liturgical, prayerful, exegetical, and theological guide for living the Christian life here and now.